Brain MRI could help improve the diagnosis of people with a common type of cognitive disorder, according to a new study published online, September 6, in the journal Radiology. Our findings mean that a simple MRI test might improve the diagnostic work-up of people with suspected vascular cognitive disorder, and holds further promise to track progression of the disorder. Brain MRI could help improve the diagnosis of people with a common type of cognitive disorder, according to a new study published online in the journal Radiology. Vascular cognitive disorder is caused by disease of the vessels supplying blood to the brain. Strokes and transient ischemic attacks, or ministrokes, are risk factors. The resulting loss of healthy brain tissue adversely affects concentration and decision making and leads to problems with planning and organizing. Prevalence of vascular cognitive disorder is increasing in the elderly, and it can be challenging to diagnose and differentiate from other forms of dementia like Alzheimer’s disease. A biomarker that could predict and track vascular cognitive disorder on imaging exams has yet to be found, although MRI measurements of the brain’s signal-carrying white matter are a promising area of research. 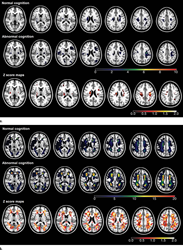 Damage to the white matter can be assessed with diffusion tensor imaging, an MRI technique that provides two important measures of microscopic brain damage: mean diffusivity and fractional anisotropy. Increased mean diffusivity, which measures the movement of water through tissue, is particularly sensitive to the breakdown of nerve fibers in the brain and the protective coating around them. “The analogy would be a construction site at one of the main subway lines causing traffic disruptions,” Dr. Auer said. “This will be a critical step in the quest for prevention of vascular dementia, by helping to identify those at risk, and by enabling imaging studies to evaluate the effectiveness of interventions,” Meng said. “Lesion Topography and Microscopic White Matter Tract Damage Contribute to Cognitive Impairment in Symptomatic Carotid Artery Disease.” Collaborating with Meng and Dr. Auer were Akram A. Hosseini, Ph.D., Richard J. Simpson, Ph.D., Quratulain Shaikh, M.Sc., Christopher R. Tench, Ph.D., and Robert A. Dineen, Ph.D.